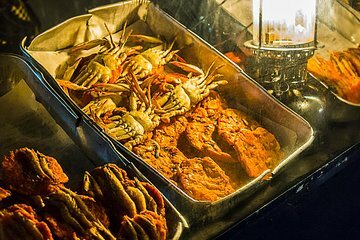 Discover the sights, scents, and flavors of Sri Lanka’s finest street food on this half-day tour with private driver/guide. Tour 3-story Kollupitiya (Colpetty) Market and the Malwatte Road Street Market by Colombo Fort. Sample roti at a humble tea shop, and traditional pickles and juices, then splurge on street food with ocean views at Galle Face Green. Finish with a sit-down “kottu roti” feast at Nana’s restaurant.